Ministers have promised a new era of cleaner, greener flight, including electric planes, backed by £343m of industry and government investment in the aerospace sector. Business department BEIS told Transport Network that 51% (approx £175m) of the total pot will come from the Government. The lion’s share of the cash – £255m – will go towards 18 new research and technology projects, including the development of hybrid aircraft supported by the Aerospace Technology Institute (ATI) and UK Research & Innovation (UKRI). To support small and medium-sized companies, £68m will be made available to increase research and development opportunities, with £20m to drive improvements in long-term productivity across the sector. BEIS said the projects will position the UK as a world leader for technologically advanced aircraft that will ‘transform the face of aviation’, including electric aircraft, hybrid-electric propulsion systems, and future materials for aircraft manufacturing. Aviation minister Baroness Sugg said: ‘The development of quicker, quieter and cleaner aircraft will transform the UK’s transport market and open up new and more sustainable ways for passengers to travel between our cities and regions and across the globe. Officials said the ‘revolutionary’ £58m E-Fan X project (pictured) would be major beneficiary of the funding. 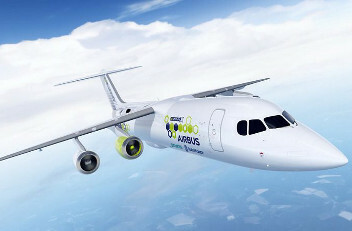 The project brings together Airbus, Rolls-Royce and Siemens to develop a flying electrical demonstrator that aims to form the foundation for future electrical aircraft. Rolls-Royce is also running a series of projects on ULTRAFAN, and ACCEL, worth a total of £70m. Officials described ULTRAFAN as ‘a new generation of aircraft engine that aims to transform flight, setting new benchmarks in efficiency, environmental performance and precision engineering’. ACCEL is intended to accelerate the adoption of electrical technology in aviation through the design, build and flight test of a high performance electric powertrain - the mechanism that converts the drive from the engine of a vehicle to its axle. Business and Energy Secretary Greg Clark also announced the start of formal negotiations for an Industrial Strategy aerospace sector deal, with discussions expected to conclude before the end of the year.